Third party candidates and write-ins are today’s topic in our #TXDecides series. All this week, public radio stations across the state are answering your questions ahead of Election Day. So can Texans vote for third parties? And how easy is it for third parties to get on the ballot? In French bakery near Austin, Kaia Tingley is busily answering emails on her laptop. Tingley is a digital marketing consultant, a mother of two, and an unenthused voter. She’s researched Donald Trump and Hillary Clinton — and says she doesn’t like either of them. “I’m actually still undecided, I mean I know I’m not voting for Trump,” she says. But when she talks to friends and family about possibly voting for someone else, she gets push back. “If you talk about voting for a third-party candidate there’s an enormous wave of peer-pressure coming back to say, ‘Oh, you can’t do that or the other guy will win,’” she says. Disapproval of her peers aside, Tingley could easily vote for Libertarian Gary Johnson or the Green Party’s Jill Stein. 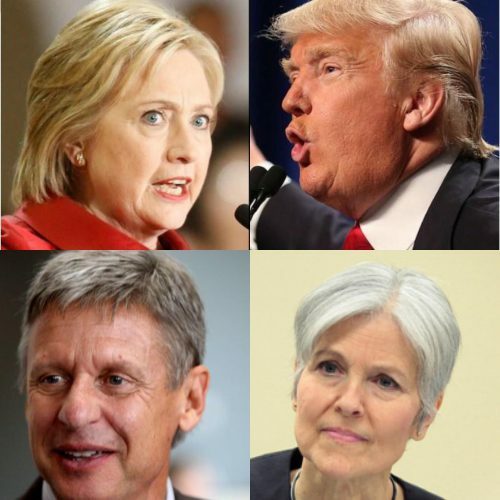 Johnson’s on the ballot in all 50 states, Stein’s included in 48 of them. Texas Secretary of State Carlos Cascos says, like Trump and Clinton, Johnson and Stein both met the requirements. “In Texas a third party candidate such as the Libertarian or the Green Party, if they receive 5 percent or more of votes in the last general election then they are qualified to be on the ballot,” Cascos says. Both Stein’s and Johnson’s parties reached that threshold in Texas during the 2014 statewide elections. It’s automatic. Without that 5 percent, Secretary Cascos says a third party presidential candidate can still get on the Texas ballot by presenting a petition signed by 1 percent of Texas’ registered voters. That’s roughly 150,000 signatures. Tingley certainly isn’t the only Texan toying with the idea of voting third party. Dawn Westerberg often votes Republican and is facing some backlash when she tells friends she’s voting for Johnson instead of Trump. “First, there is absolute fury from those who support Trump and saying if you don’t support Trump, then you must support Clinton,” she says. Aundrea Ryden, in downtown Austin, says she usually votes Democrat but is leaning toward Stein. “I was undecided at one point, I don’t really stand for what the other two candidates stand for, so I was just looking for an alternative option,” she says. Then there’s the case of Courtney Dry, who was waiting on a city bus. Dry’s a former Bernie Sanders supporter, and wishes he was running as an independent. “I read this article that says if Bernie Sanders stayed in, like all of them voted for him then it could all be voided, I guess you would say, because none of the candidates would reach 270,” Dry says. By the way, the winning presidential candidate has to capture 270 electoral votes. Now, Dry says, she wants to write in his name on the November ballot. So what about write-ins? Cascos says the votes for some write-in candidates will be counted. “For statewide races they are certified by our office and we have 13 certified write-in candidates that will eligible to be running in the elections,” he says. Eligible write-in candidates had to declare their candidacy and file their paperwork between July and August. Elections officials, legally, must post a list of those candidates for president in every voting booth and to include that list with ballots sent in the mail. But if you write in the name of someone who isn’t on that certified list – someone like Bernie Sanders – well, that vote won’t be counted. – Ryan Poppe, Texas Public Radio. This story originally appeared here. This entry was posted in KRTS News and tagged Election 2016, Gary Johnson, Jill Stein, politics, Presidential Election, Texas Politics, Third Party Candidates, Voting. Bookmark the permalink.